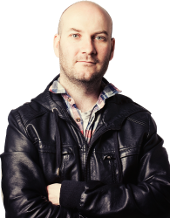 Way back in 2010, Ian Stewart added a sample WordPress theme options page to the Theme Shaper blog. I’ve been using that ever since as my go to snippet for creating admin pages. Unfortunately, over time I have slowly adapted it to my needs and every time I need to use it again, I ended up having to rewrite large chunks to suit newer ways of doing things and generally adding a little more code polish. With that in mind, the code below is my new go to snippet which I’ll be maintaining myself. Feel free to copy and paste it into your own projects. If you can see any ways to improve it, please let me know in the comments section. * Ryan's example admin page. * Set some constants for setting options. * Init plugin options to white list our options. * Create the page and add it to the menu. * Output the admin page. 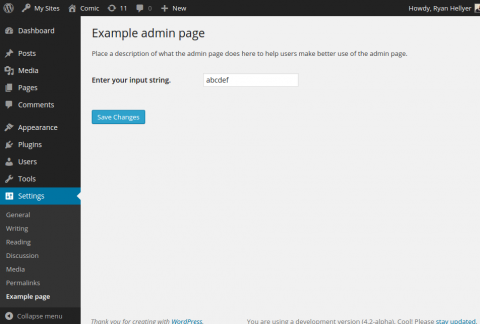 The view of the live example WordPress admin page.